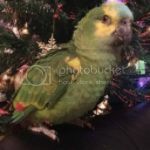 Parrot Forum • View topic - To clip or not to clip? 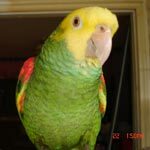 Hi all, my Hannah is around 5 months old and had been clipped when i got her, when her new flight feathers come in i'd like to let her fly, and begin the training, but she lives in a family home, we have a few small dogs who are all great with her and younger siblings, she gets lots of out of the cage time when people are around and when im there but, as theres lots of traffic i worry she might get out and i wont see her again! Would it be best to let her re-grow her flight feathers and only let her out when im there so she can be fully supervised or get her clipped but she can be out more etc to minimise the risk of escape, we use common sense with windows and doors etc but with younger siblings etc doors could get left open without realising etc... Would really appreciate feedback! Thanks! Birds can still get out doors and windows clipped I think you should leave him flighted and let him out when your around I have a African grey myself Female I think because she likes men most they arent the type of birds that fly around all day like a budgie.Also my African grey Tiko dosent make any african grey sounds she only talks and makes sounds from Tv and other things and even copied the cockatiels chirp.Also if you get her a harness it would be fun to let her fly in the park or something I bring my cockatiels everywhere. You can also close the doors your bird is in so she cant leave that room. ParrotsForLife wrote: You can also close the doors your bird is in so she cant leave that room. When a bird flies it gets the exersize that nature intended so it is healthier. By all means let her flights grow back in, the ability to fly has all kinds of affects on a bird mentally, emotionally as well as physically. A bird that is capable of flight becomes a much more confident bird and smarter as well as flying requires spatial orientation as well as near instant problem solving capabilities, you don't have a lot of time to make decisions while airborne. But also take all precautions to keep your friend safely enclosed at all times. That doesn't mean in the cage. I clipped one bird in my entire life (had hundreds of them) and regretted it immediately after. People say they do it for the bird but I don't know how handicapping an animal has ever had any benefit to it. The truth is that they do it because they don't want to put the work into providing a safe environment for it and, when you have dogs in the house, as you do, you pretty much have no choice but to allow them flight because a grounded bird is a sitting duck. I suggest you establish what I call 'buffer zones' so even if the door to the room where the bird is out and flying is opened, there is another closed door between it and the outdoors. Little signs saying "DO NOT OPEN - BIRD IS OUT" that can be hanged from the knob also work. A budgie I once had died and it was because he was clipped he was on the floor happily eating millet and my sister didnt know he was there and jumped beside him and he got a fright and had a heart attack but if he was flighted he could have flown away.